Buying a new home is a big step in anyone’s life. A new home certainly provides new and exciting opportunities in your life, but it can also provide new opportunities for mold to creep into your life, causing some serious headaches. As such, it is important to know what to be on the lookout for in order to avoid mold sneaking up on you in the house buying process. Below are some suggestions for ensuring you don’t end up with mold as a less than pleasant housewarming gift. Judging the exterior of a house for sale can be a little tricky. One of the big things a seller is likely to do prior to putting a house on the market is spruce up the exterior of the home in order to boost curb appeal and draw in potential buyers. A drawback to this is that the fresh coat of paint can sometimes mask important issues that have gone unresolved, so pay extra close attention to little details (also important in inspecting the interior). Perhaps the most important aspect to look into with regard to the exterior of the home is the roof. If the roof looks like it’s worn out, there’s a good chance that it is—and that there are leaks because of it. If you notice any of the above, make sure that you pay extra attention in the attic, as there could be serious issues that have gone unnoticed there (more on that in a bit). • Clogged gutters can cause leaks inside. Either of these above issues can lead to an accumulation of water entering and causing damage in the attic or basement, respectively. The easiest places to catch a mold problem are the places where there’s most likely to be water damage: under sinks, around bathtubs/showers, and behind refrigerators, so pay close attention, first and foremost, to any appliances or fixtures that involve water in some way (water heaters and washing machines are other likely culprits). 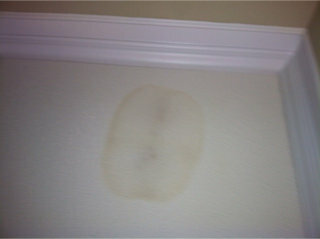 Any kind of leak could mean a mold issue. Another great place to make sure you look around for mold or water damage is any kind of attic area in the home. Any leaks in the roof might lead directly to water damage going unnoticed in an attic. In addition to the attic, be sure to check out any basements or crawl spaces for signs of water damage and mold. Leaks from upstairs or water coming in from outside could be the culprit. Also, don’t forget to take some time to take a good look at the ceilings in each room carefully. If you see water damage or spotty paint jobs on ceilings (or coming down walls), then there is a chance that the paint is hiding water damage and potential mold issues. Your nose can also help you decide whether or not you should be concerned about mold. In particular, you are looking for any mildewy or musty smells within the home. While houses that haven’t been lived in for a while may smell musty, you could also be smelling mold, especially if you see any visual indications of water damage. • If the windows are fogged up, they may be allowing water vapor to enter, which can lead to mold issues. • If the doors have trouble opening and closing, it could just be poor installation, but it could also be a potential sign of moisture accumulation, so take a closer look. • If you find that the water pressure is not up to par, this could be a sign of plumbing issues waiting to be found. So what should you do if you have mold concerns? It’s always a good rule of thumb to have an inspection (in addition to an appraisal). 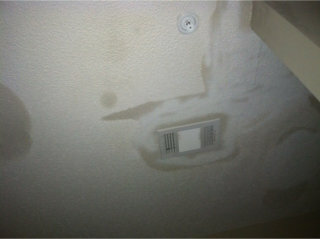 A licensed inspector can help you investigate any concerns you have about water damage and mold. Not only can this be helpful in finding mold issues, an inspector can help assess if there are any other problems lurking in your new home that might give you issues down the road. A final piece of advice regarding hiring an inspector: Be sure that your inspector has a clear path into any attics, basements, or crawl spaces before they begin, though, as some states prohibit inspectors from clearing their own paths to those areas.